The fifth Baron Abercromby (1841-1924), a soldier and keen archaeologist, published this two-volume work in 1912. His especial interest was prehistoric pottery, and he introduced the word 'beaker' as a term to indicate the late Neolithic/Chalcolithic western European culture which produced these characteristic clay drinking vessels. 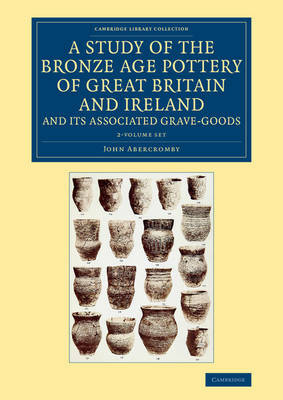 His aim was to produce a chronological survey of British and Irish ceramics from the late Neolithic to the end of the Bronze Age, to classify these by type and geographical area, and to examine the goods associated with dateable pottery in burials and cremation urns. This heavily illustrated work also puts the British beakers into their European context and considers the possible indications of movements of people given by variations in style. In Volume 1, burials are considered, while Volume 2 surveys cinerary urns and their associated smaller pottery, and in both, the ethnography of skeletal remains is considered.